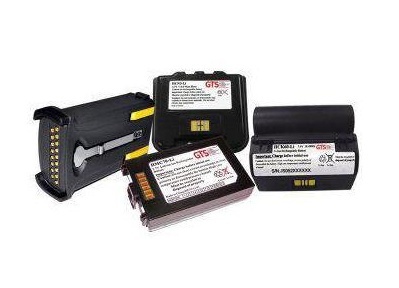 A range of spare batteries for mobile computers, mobile printers, tablets - any mobile barcode and RFID device. Your employees will be more productive when they get full-shift capacity batteries for their portable printers. Portable printers need a considerable amount of battery power to make it through a day, and employees lose valuable time every time a battery fails. Multiply that figure by your number of mobile workers and you can see what poor-quality batteries cost your company. With our batteries, your employees’ portable printers will run longer. That means more productivity from your workers, and fewer batteries to purchase over time. We also offer the charging products you need to keep your printers working at their best. Check out our complete product offering for portable printers. All of our products are guaranteed compatible with your OEM device. The H16004-Li is an upgrade to the OEM P/N AT16004-1 that is used in the Zebra QL220/QL320 portable printer. It extends the device’s operating time and reduces the total number of batteries needed. The H16293-Li is an upgrade to the OEM P/N AT16293-1 that is used in the Zebra QL420 portable printer. It has up to 10 percent more capacity than the OEM model. The charger for the Zebra QL320 Series portable printers will provide a dependable charge to your Zebra QL220 or QL320 device. The HMZ220-Li is an upgraded performance battery for Zebra MZ220 and MZ320 series mobile printers. It replaces OEM part number BT17790-1. The HON5003-Li is a direct replacement for the OEM P/N 550030 that is used in the O’Neil MicroFlash 4T portable printers. The HBP51-Li is a 100% compatible replacement battery for Intermec PB51 printers. The HPI781-Li is a direct replacement for the OEM P/N 550038-000 battery that is used in the Intermec 681/781 series portable printer. It contains the highest quality battery cells, extending run time. The HQL320-Li(3X) is an extended battery replacement for the OEM P/N AT16004-1 battery that is used in the Zebra QL320 series portable printers. HQLN320-LI(2X) - The HQLN320-Li (2X) is an extended capacity battery for Zebra QLn220 / Zebra QLn320 series portable printers. The HQLn320-Li(2X) provides additional power to your QLN220 / QLN320 / ZQ520 portable printers and is 100% compatible. The HQLN420-Li is a 100% compatible replacement battery for Zebra QLn420 printers. The HRW420-Li is an upgrade to the OEM P/N AK17463-005 that is used in the Zebra RW420 mobile printer. It provides excellent discharge characteristics and longer cycle life. The HZC15002-M is replacement for the OEM P/N CC155002 Nickel Metal Hydride rechargeable batteries that are used in the Zebra Encore 3 portable printers.